I had to immediately open the email, based on the name of the event alone. When you receive an event invite with this title, the curiosity factor alone makes you open the email and entices you to RSVP for it. 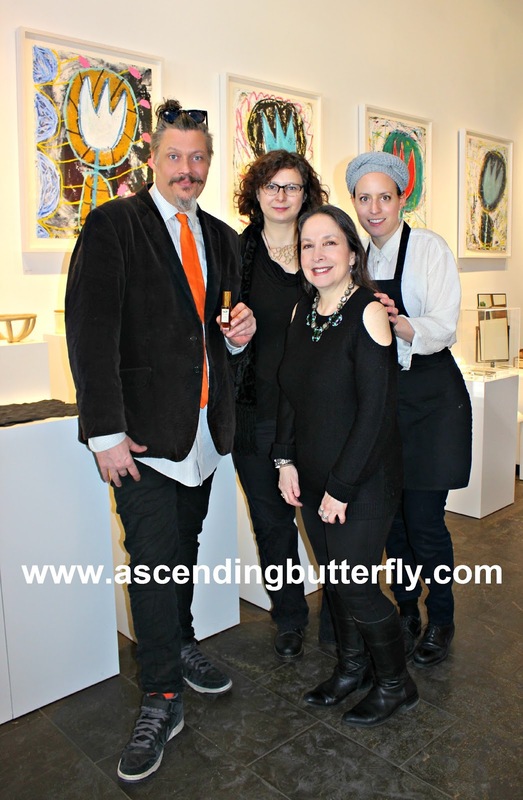 Sniffapalooza celebrates perfumery as an art, and they love to create unique experiential events where the olfactive universe is explored with kindred spirits, combining fragrance with other sensorial pursuits. This event was an interactive multi-sensory journey, an evening of sensual delights... fragrant, culinary, artistic and cinematic pairings... created for the voluptuary in us all! The event was a "meeting of sensory minds" held at MAISON 10, NYC's stunning new concept store and gallery space in the heart of Manhattan's exciting NoMad district and was the brainchild of Stephen Dirkes, a Perfumer, filmmaker, multi-media artist, founder of EUPHORIUM BROOKLYN an innovative niche perfume brand. To celebrate Euphorium's latest fragrance creation, the Voluptuary Trio Set, Dirkes collaborated with Chef Tessa Liebman and Photographer Tal Shpantzer to reinterpret and pair the fragrances in edible and visual format. And quite frankly I have never attended a Fragrance Event that interpreted Scent in quite this way before. The Voluptuary fragrances - Suédois, Pétales and Chocolatl - were designed with a focus on sensual, decadent and romantic aspects. 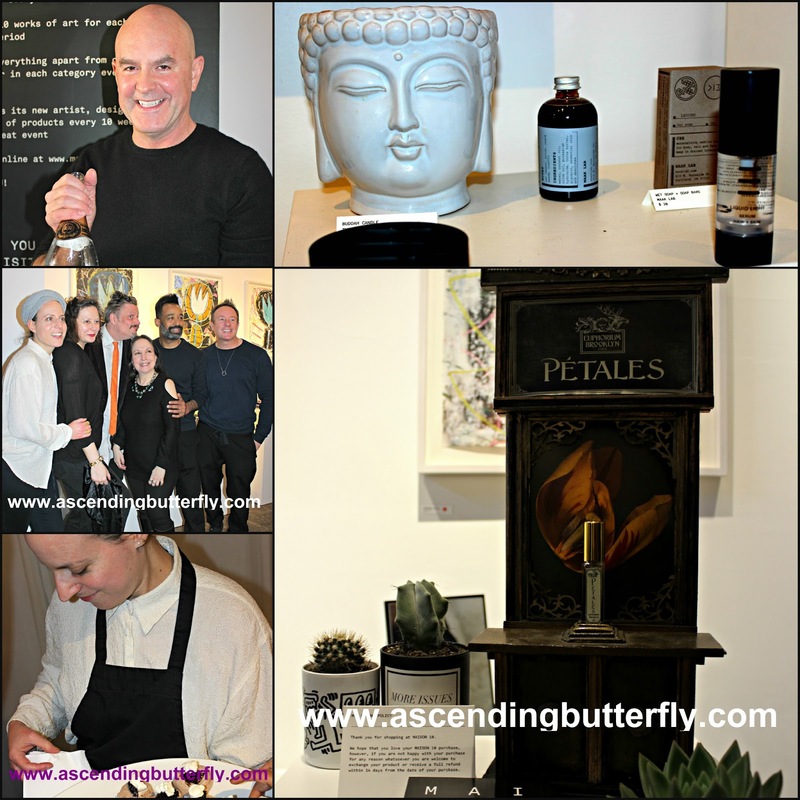 The intricately layered relationship of fragrance, flavor and imagery in the stories behind the collection came together to find perfect expression in this event. 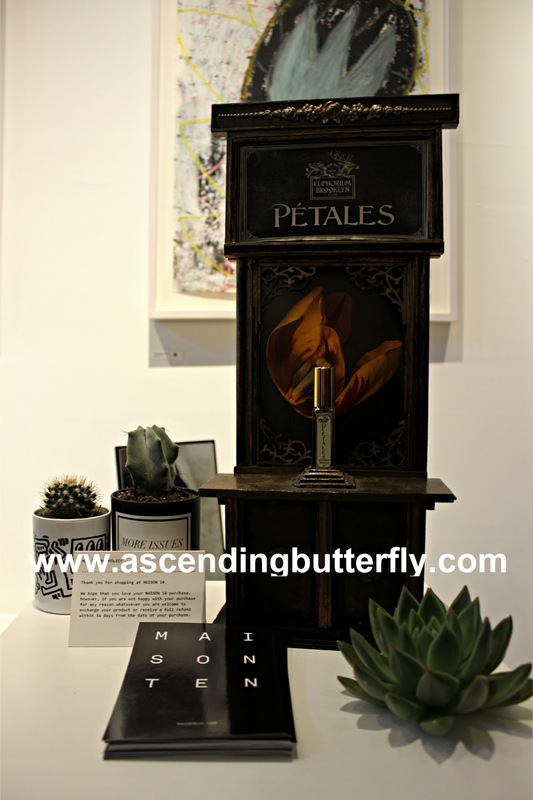 The fragrance Pétales was inspired by Tal Shpantzer's series of photographic portraits, The Petal Series, which Stephen Dirkes brings to life as a perfume. The Petal Series was on view at the event. 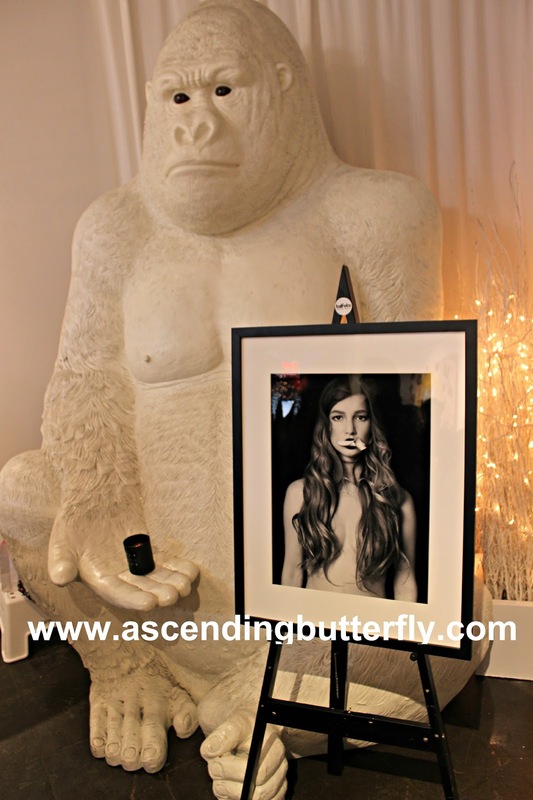 The photo above is one of the photographs in the series - and that oversized Gorilla Statue is certainly a unique backdrop! 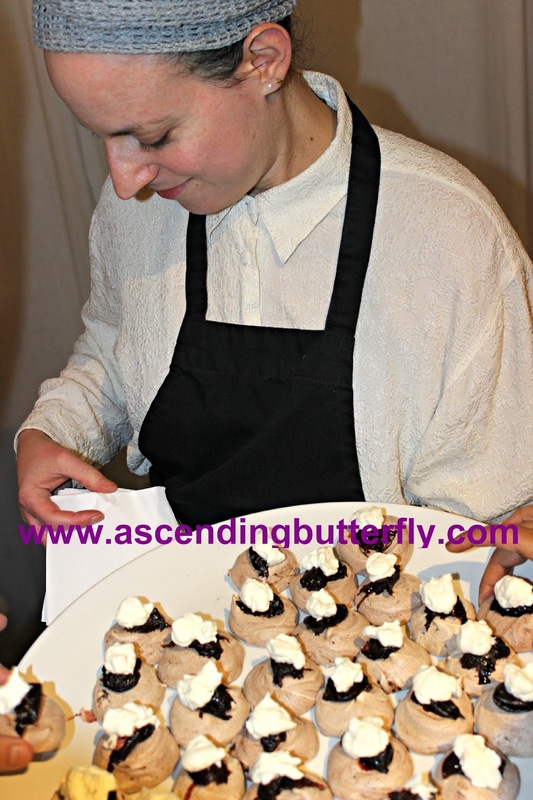 For Chef Tessa's interpretation of CHOCOLATL she conjured up a Mexican chocolate meringue base with red wine and Piloncillo stewed prunes with a creme fraiche. 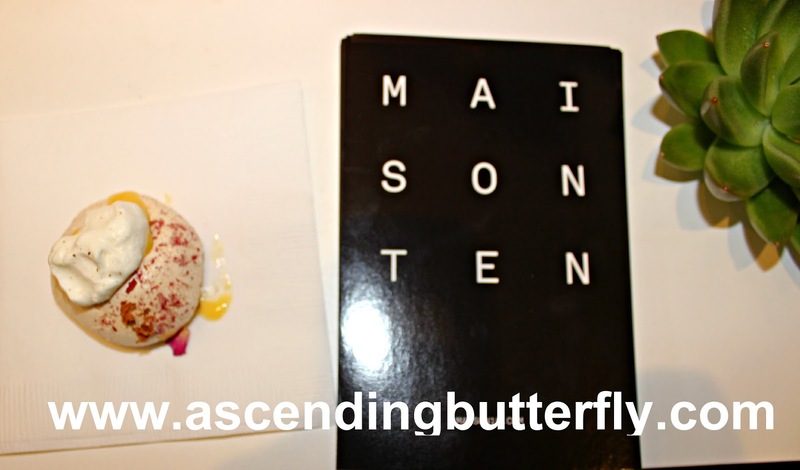 It was a rich and decadent treat that totally nailed an edible interpretation of the fragrance! 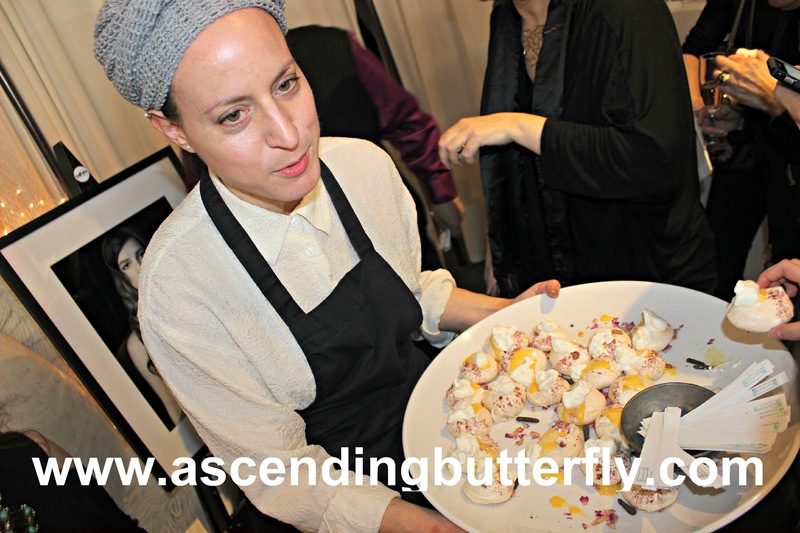 Chef Tessa's challenge was to create an edible that mirrored the notes of Petales, orange blossom, black pepper, honey, ambergris, indole, and galbanum and her creation, the elegant Pavlova pastry was her edible answer! 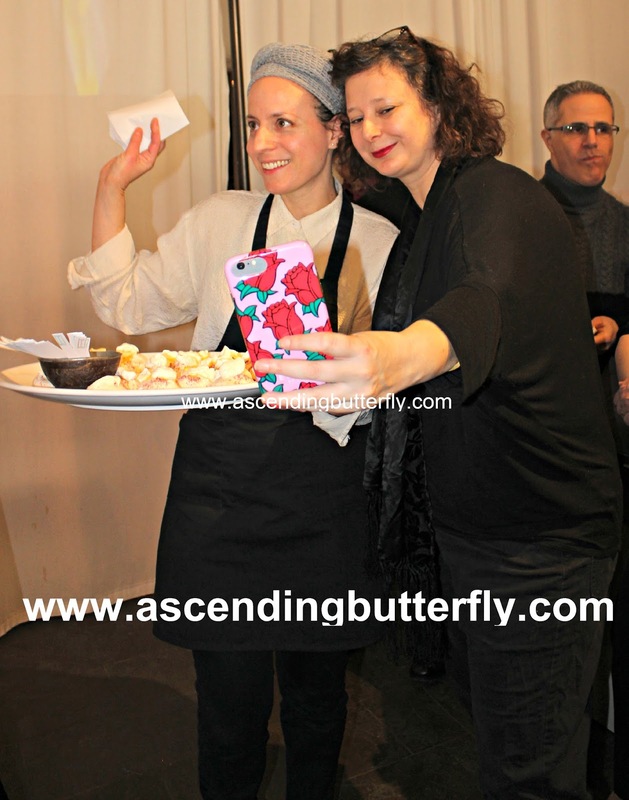 I loved catching Photographer Tal Shpantzer taking a selfie with Chef Tessa! The pastry combines grapefruit curd and orange flower water which Chef Tessa dusted with rose petal powder and mixed with rose pink edible glitter to give the effect of petals shimmering in the moonlight which is part of the story of the fragrance. I wasn't fast enough to nab a shot of the edible interpretation of SUEDOIS (suede) which is a soft leather scent that is part of the trio. The fragrance has notes of Indonesian sandalwood (you guys know just how much I am drawn to Sandalwood! ), raspberry, raisin, labdanum, vanilla cream, and tonka musk which paired perfectly with Chef Tessa’s Suedois Cream Puffs with a Ylang Ylang Profiterole Shell and Tonka Bean and Sandalwood Bavarian Cream, and Raspberries. I love the smell of Leather and Suede so this scent was definitely an appealing one for me. Stephen introduced a special sneak peek screening of Voluptuary #535, the short film he created in collaboration with Tal which will be premiered at La Jolla International Fashion Film Festival 2017. 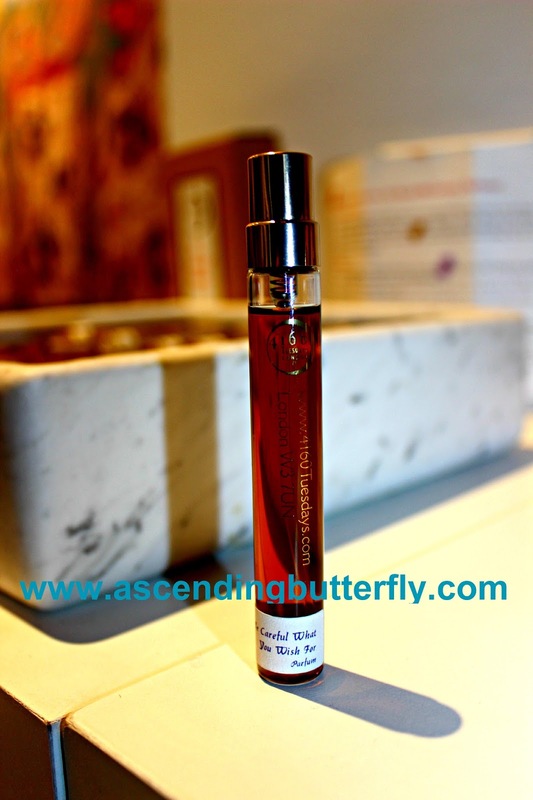 I don't want to steal the limelight from Petales, but another scent I was introduced to at the event stayed in my head called "Be Careful What You Wish For" by 4160 Tuesdays a fruity oud that you won't soon forget and I now need in my life! 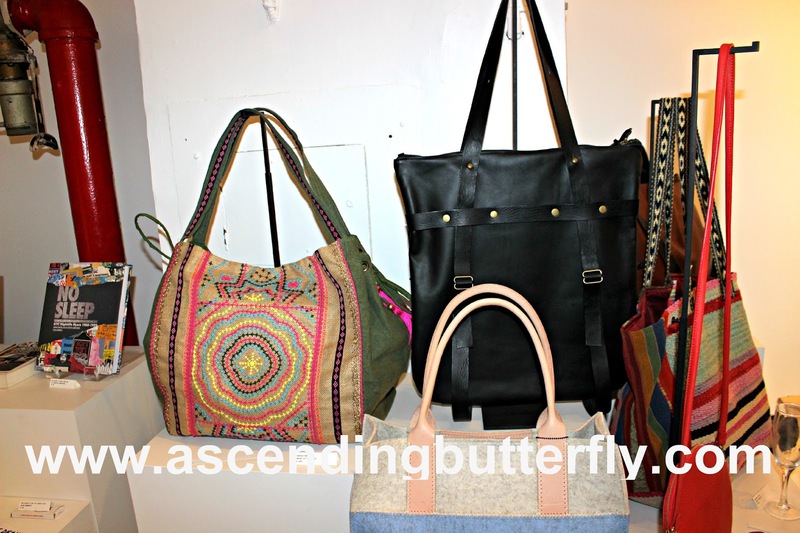 There were a variety of Lifestyle Products on display including these handbags! A few 'Adult Themed' items were on display as well. You know I love Zen art/décor accents and the Thompson Ferrier Buddah Candle stopped me in my tracks! WANT IT!!! From a photographic standpoint I love snapping a group shot when the group is looking at a different photographer, for some reason I have always loved doing this - so it's posed and not posed at the same time. 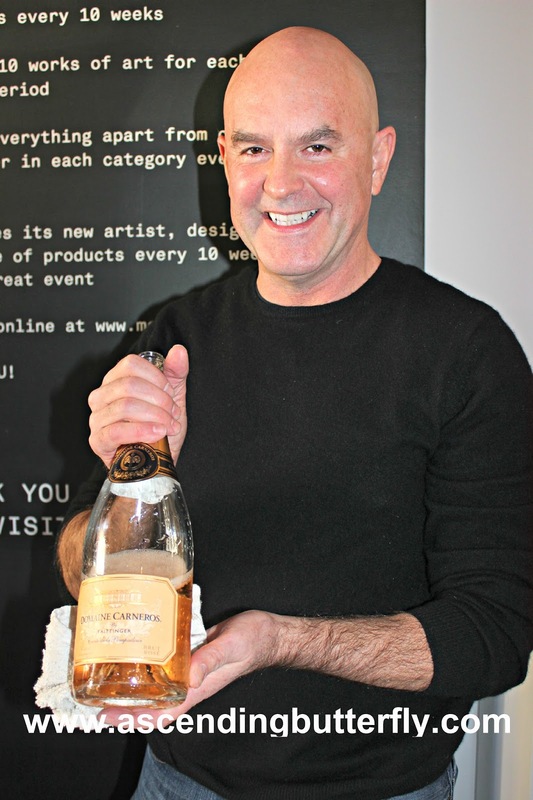 "Champagne is the only wine a woman can drink and remain beautiful."" This event was so "New York" to me in a good way. It was almost too hip for it's own good, I love the sensory interpretation and back story to the Voluptuary Trio by Euphorium Brooklyn. It was a treat for the senses combining sight, sound, scent, and amazing edibles. Another Fragrance from Euphorium Brooklyn that stood out for me was CILICE, it is not part of the Voluptuary Trio, but notable none the less. Readers Sound Off: What are YOUR favorite fragrance notes? What type of scent appeals to you most? Do you stick to the same fragrances or are you always trying something new? What a great event!!! It sounds like it stimulated all of your senses. @Masshole Mommy - There is something about Gallery events, there really is. My first visit to Mexico when I was much younger resulted in a rain day when we had booked a tour itin, the tour got cancelled our monies refunded but no one wanted to tool around the hotel, we ended up taking a bus into the city and visited a Gallery that was small and we all being art lovers went through it rather quickly. On our way out an employee asked us questions on the exhibit that required us to delve a bit deeper, it was the gallery owner and he taught us a great lesson on digging deeper and being more observant, so I took that lesson with me always. This Gallery reminded me of that trip so much. It definitely was a treat to the senses! You always go to the coolest events. I mean seriously, I have never seen a post on an event you've been to and thought, "Meh. Lame." 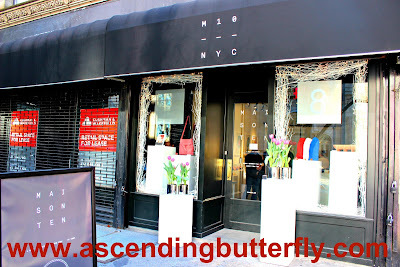 @Ben - New York City is truly a Lifestyle Bloggers "Wonderland" there is something for everyone here. And event planners here really do set the bar high. I was an event planner as well, I have been toying with the idea of hosting something myself one of these days. I get invited to a ton of events out in LA and Miami and their events look super fun as well. This event does seem very "New York" and looked so fun and hip! I tend to gravitate towards light and clean scents like lavender or lemon. This looks like a great event! I love when you go to an event and learn as well as have a great time and meet awesome people. Wow, looks like you had a great time and it looks like it was a fun event. Great pics! I would love to attend an event like this! I blend my own perfumes with essential oils although I am no expert. Scent is tied to the sense of memory so it is magical! I see it as an art form so this venue is so befitting of this event! I easily see how all of these things tie together when it comes to an aroma! LOVE THIS! This place looks amazing, I wish is all the stores had this, I would enjoy shopping more! Sniffapalooza sounds like fun. Fruity scents are one of my favorites, so I'm pretty sure I'd like the "Be Careful What You Wish For" one. @Fatima If you are based in New York City or plan to visit you should definitely check out Maison 10 it is a gallery and retail location, you can also join in an upcoming Sniffapalooza events as well, the next event is on the 26th of this month, March, just add yourself to their mailing list or check out their events page periodically. Looks like a very fun event! The food and wine look delicious! This looks like it was a great event. I bet the Pavlova pastry was amazing. @Catherine They were all amazing interpretations of the notes in the scent, an incredible 'multi-sensory' treat in every way! This event looks like a lot of fun! I love that it touches on all of the senses to make for a well rounded experience. Looks like a fun little event that you got to attend. Those appetizers looked delightful! This looks like an incredible event. I bet you have some great memories. That looks like such a cool event. I love that they interpreted the scents through food too. @Pam This is definitely the most unique part of this event. I have done Wine and Chocolate tastings before, but Wine, Chocolate AND Scent? This was a new one for me! Wow, looks like a great time. I am so incredibly sensitive to smells that it takes a long time to find one I like. The most subtle and fresh scents are winners! @Amanda I find folks with scent sensitivity issues do well with oils instead of sprays. Is there something on the market you use and love or do you create a custom scent? That was one unique event. Kudos to the event organizers for putting together something unusual but interesting! I hope to attend something similar too. @Eileen If you are based in New York City or plan to visit you should definitely check out Maison 10 it is a gallery and retail location, you can also join in an upcoming Sniffapalooza events as well, the next event is on the 26th of this month, March, just add yourself to their mailing list or check out their events page periodically. @Befitting Style - Indeed it was! Woah! I love those art in that event, I'm really glad that you are part of this event, I've never been in an amazing event like this. @Nikki - Isn't Tal's Photography Stunning? and the way the event tied the scent to the photographs/potraits to the food was incredibly unique. Where are you based Nikki? There was so much happening at that event between the scents, the food, the art and displays, and in a great space. 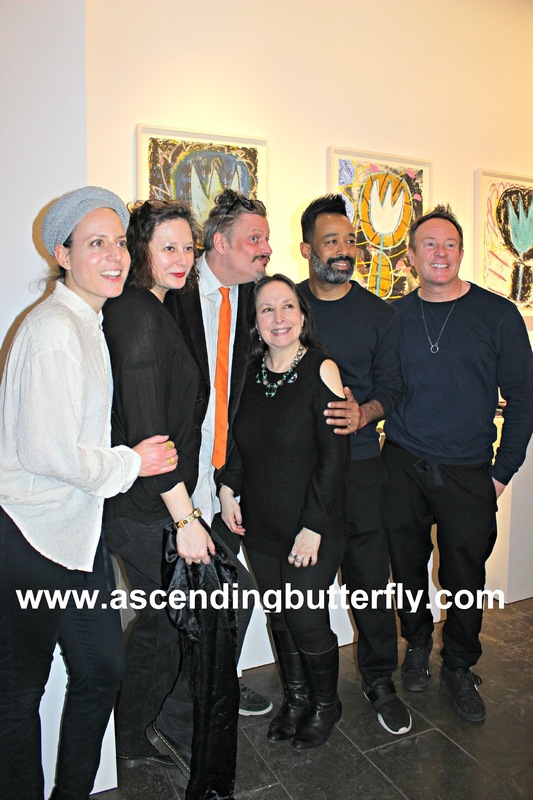 Thanks for sharing and I would love to be invited to your next soiree. 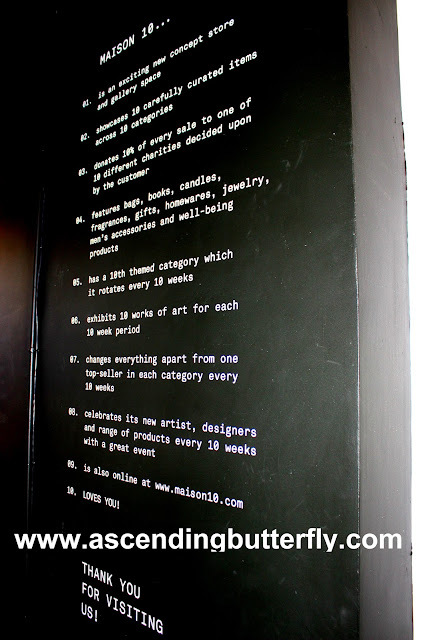 @Melissa - If you are based in New York City or plan to visit you should definitely check out Maison 10 it is a gallery and retail location, you can also join in an upcoming Sniffapalooza events as well, the next event is on the 26th of this month, March, just add yourself to their mailing list or check out their events page periodically. I am not the organizer of this one, but I have been toying with the idea of hosting something, I have had a lot of bloggers tell me I could do most events we attend better, and I have had brands ask me to host in person events. Wow look like it was an amazing event with a variety of things to see and do. What a fun event, and yes, the name would have had me scurrying to open the invite too. Sounds like a stimulating experience for all! My father-in-law would like this I think. He has a great palate. This really looks like it would be a culturally-enriching experience. This sounds like a fun event. I can't wait to see the products in the store too. This sounds so interesting! I didn't know they had stuff like this. What fun! What an interesting concept to bring those two things together. So glad you got to to go to this! What an exciting event. I bet it's super fun to create your own scent. An event with food and amazing fragrances sounds amazing. Thanks for sharing! What a fun event for all the senses! I love trying new scents out and especially enjoy fruity ones. awww, looks like a fun fabulous event. Gotta love those samples. Thanks for sharing! Please let me know the next time you are here Angela, let's meet up! Wow those samples look great! I come to NYC alot, maybe we can connect and go together!! Wow! Sounds like a really interesting event and a lot of fun! I love the way they implemented the theme throughout. I agree Deborah, they did a fantastic job carrying the theme through! What a great event! Sounds like you had a fabulous time!! @Ricci Sniffapalooza events are always great! What a fun event! You must of had a blast - these pictures are great and it looks like soo much fun! Loved that song by Mariah! :) That looks like a must visit store. Everything a woman wants is in there. Bet you had a blast. Look at the food! Yum! 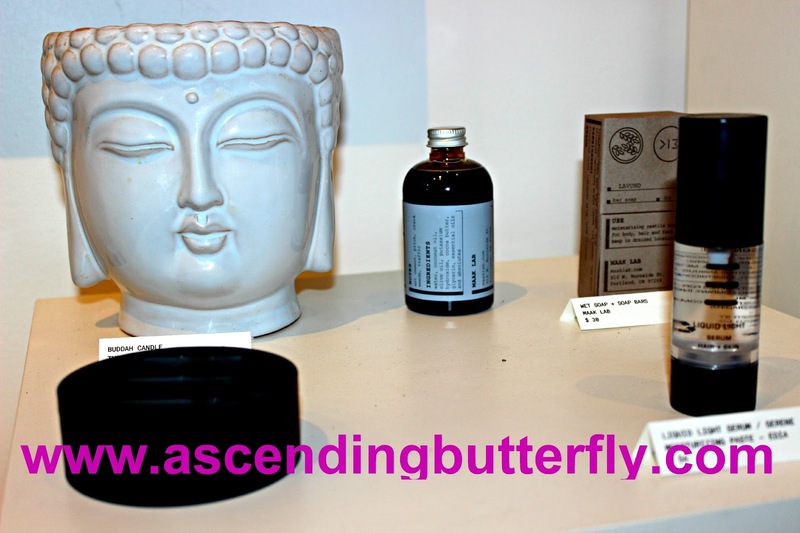 @Lynndee Actually they offer a really well balanced range of Lifestyle Products for men and women as well as home décor and accessories. Consumers want their shopping experiences to be efficient, convenient and enjoyable — and while Internet stores offer them many benefits, they know physical stores still do, too. How Well Do You #KnowYourYogurt ?